Jacques Grandchamps and Valerie Sans are busy, international small business owners with the usual challenge of wearing many different hats. 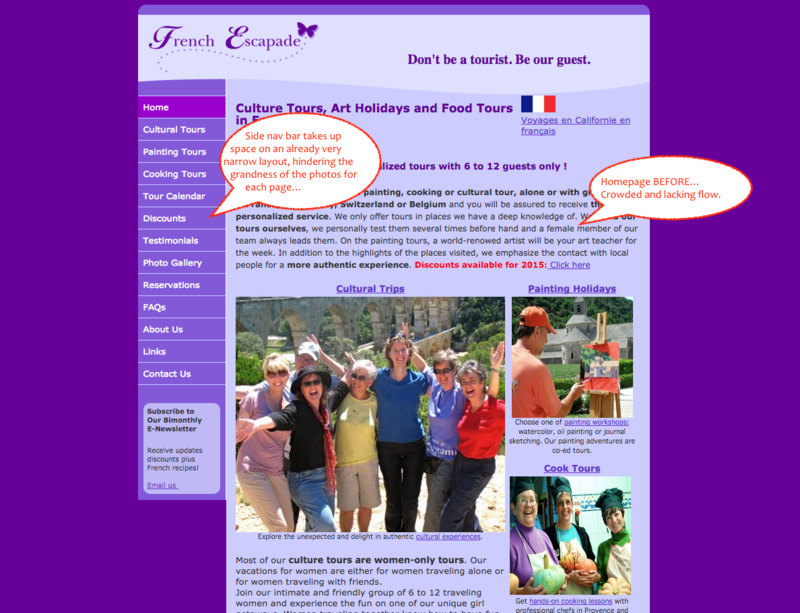 French Escapade Tours offer cultural tours, painting tours and cooking tours throughout France, Spain, Belgium and Italy for most of the year; then a few months in San Francisco providing US tours to Europeans. They are esteemed experts in the European culture and geography and provide breathtaking, personalized tours – which leaves little time to manage a website, much less manage the newest marketing trends for web conversions. 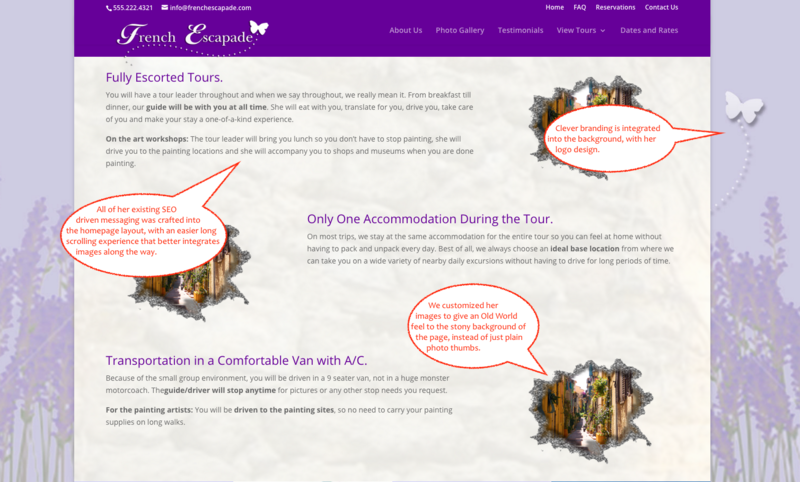 Their website was over ten years old, which not only showed in the design but also showed in the inefficient navigation function, creating friction for their visitors to quickly convert and reserve directly with their tour over a competitive marketplace of other tour operators and tour aggregators. 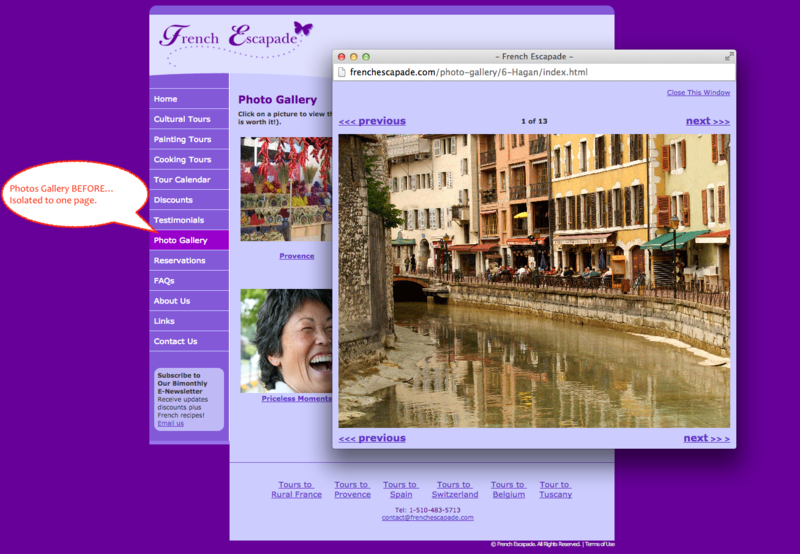 They have no shortage of photos from the many tours they have given over many years; however, their current website does not provide an easy way to integrate these images into the visitor experience. Instead, they are stacked into long scrolling, narrow pages, along tiny print. Customers are also still beholden to snail mail for reservations and payments, making it all the more difficult to get their many website visitors from all over the world to buy. 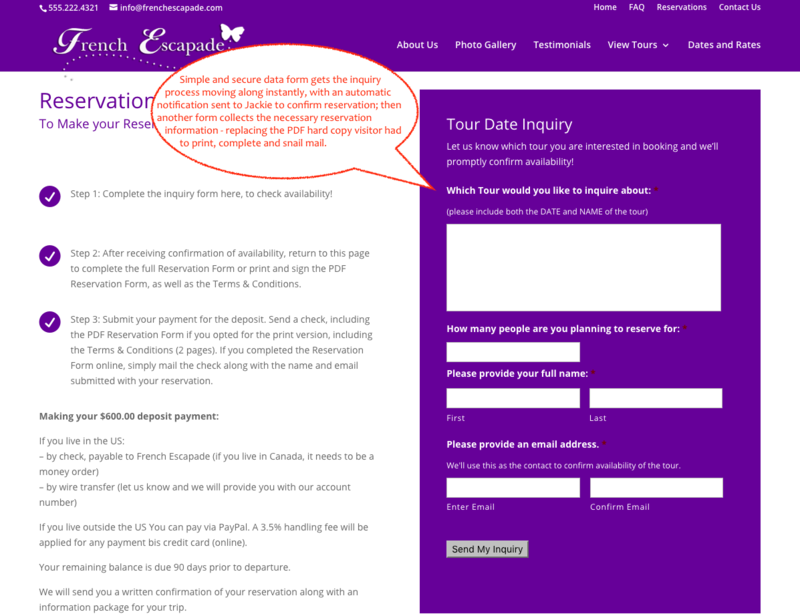 And, full disclosure, I have taken French Escapade Tours and know, firsthand, the quality of this tour – which was not at all represented in the quality of the experience visiting and booking on their website. 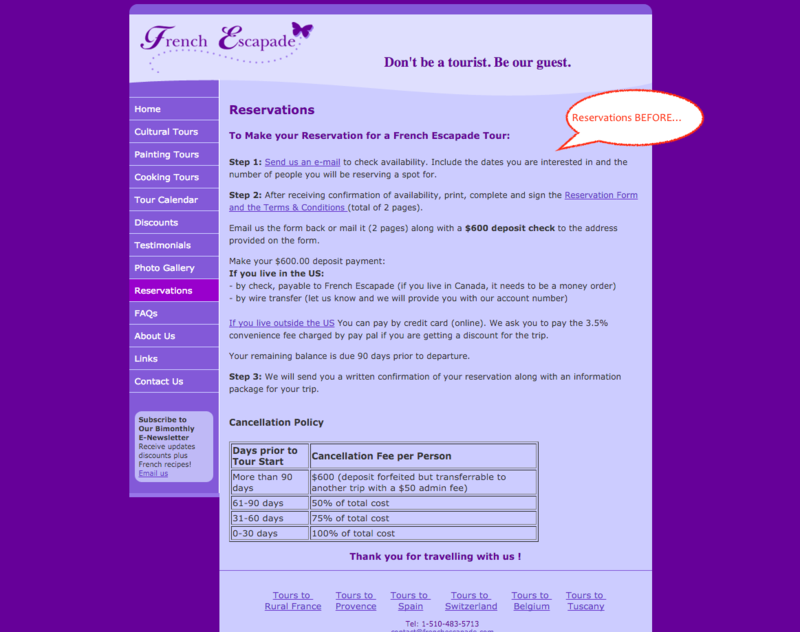 French Escapade needed the qualiant touch. We made a simple layout that was somewhat similar to the flow of her current site, to support her SEO groundwork on each page. We leveraged the wide, modern layout to display those grand, sweeping landscape images that everyone salivates over and longs to visit. 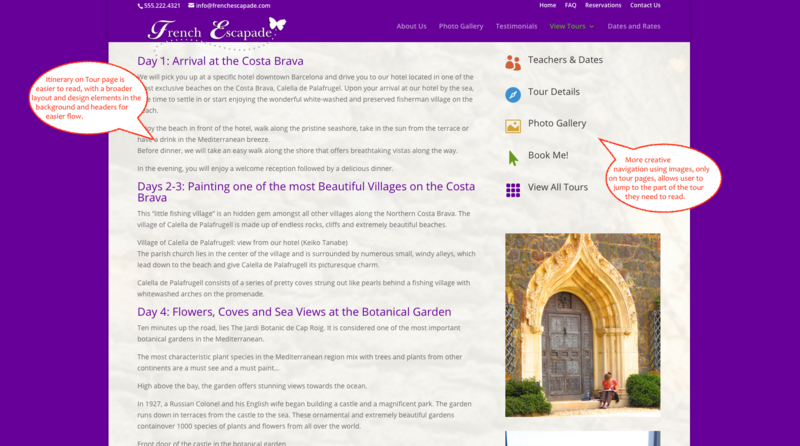 We crafted custom navigation graphics in the European ‘Old World’ design scheme and kept a similar layout for each tour type, so visitors were clear on the type of tour page at the very top, before displaying the detailed itinerary information. 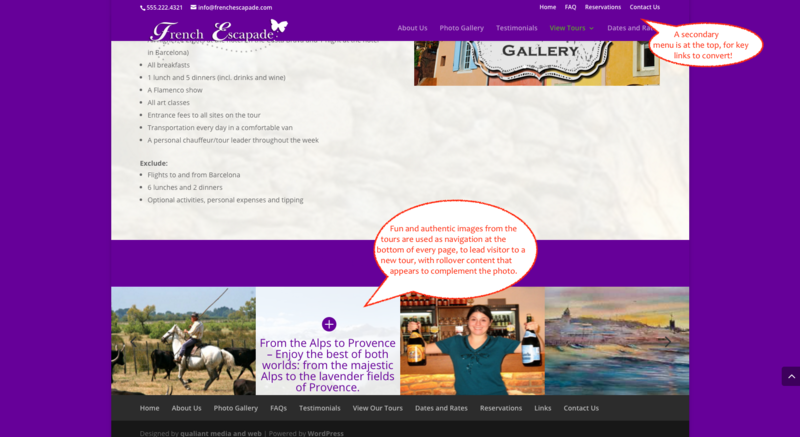 Her testimonials statements from dozens of clients were subtlly added to each page, for a balanced call to action throughout the site, and those beautiful photos, taken firsthand by herself and visitors, were utilized in the navigation structure, to entice visitors to view each type of tour while making their decision. 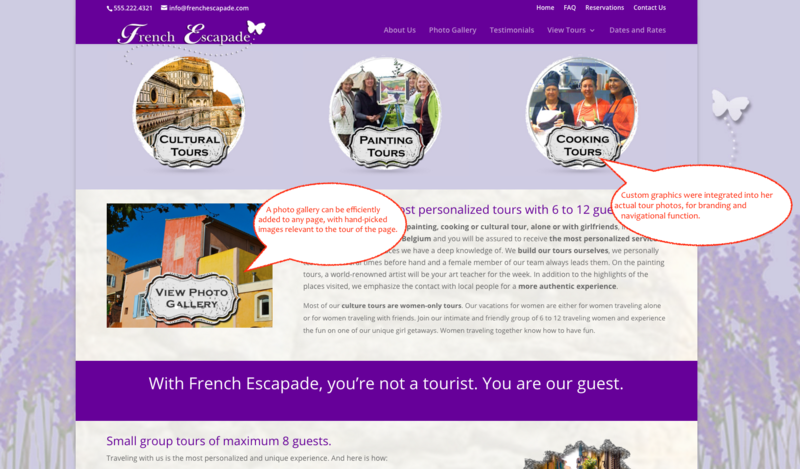 We installed a user-friendly design template with flexible options for implementing key elements of a website from actual tour photos to backgrounds for branding and social media sharing and data forms for reservations. Then we provided training on the WordPress dashboard, enabling her with the flexibility to invest in the brand touch and expert design but input all the content herself. 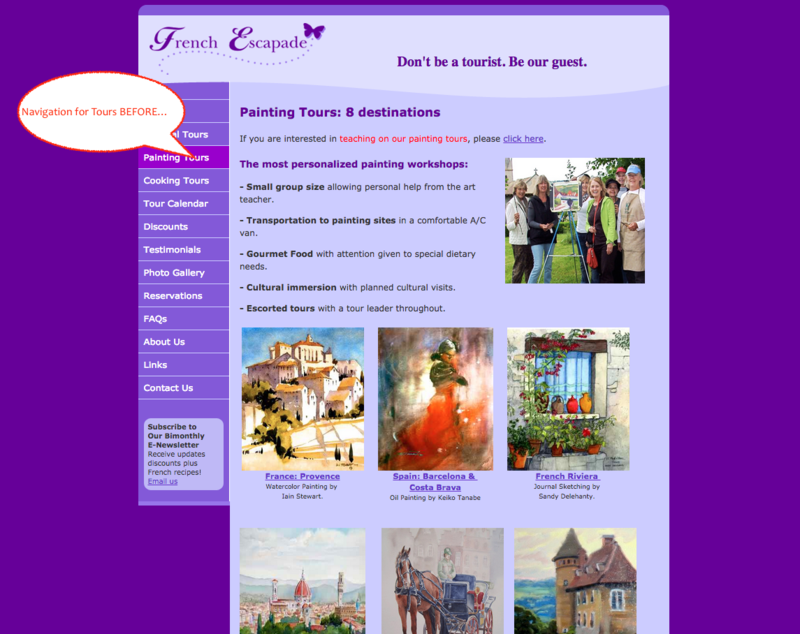 * New site is not yet live, with content transfer into new design still in progress by the client. Maybe it's time to take a look at your Brand experience.